Kobe Bryant's fans might have to buy another jersey next season. That's because multiple sources have told ESPN.com that Bryant will change his number to 24 next season. Bryant began his career at Lower Merion High School in Ardmore, Pa., wearing No. 24. But by 1996 -- the year he led the school to the state championship -- he had switched to No. 33, the number his father Joe "Jelly Bean" Bryant wore in high school. In order for a player to change jersey numbers at will, he either has to change teams or have the team inform the league of the decision more than six months in advance. Players who stay with the same team must have worn the same number for four seasons or longer. Sources say the Lakers informed the league of Bryant's wish to change his number by this year's March 3 deadline. Calls placed to Bryant's agent Rob Pelinka and the Lakers were not immediately returned. Over the past few months, Kobe Bryant's popularity has been on the rise again. His jersey was the fourth-best seller this season, up one spot from last year's position, according to sales at the NBA Store in Manhattan and on NBA.com. When Bryant came into the league, he couldn't take the No. 33 because it had been retired seven years earlier by the Lakers in honor of Kareem Abdul-Jabbar. Bryant arrived at the No. 8 for two reasons. It was the number he wore when he was a kid playing in Italy. It also tied into the number he wore at Adidas' ABCD Camp, 143. The numbers add up to 8. Bryant's switch is the NBA's most significant jersey number change since the 1994-95 season, when Michael Jordan came out of retirement wearing the No. 45 for the final 22 games of the season. Jordan's No. 23 had been retired by the Bulls in his honor. For the next three seasons, Jordan went back to the No. 23. 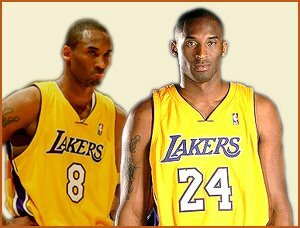 Bryant said on TNT that he wanted #24 as a rookie, but it was unavailable, as was #33, retired with Kareem Abdul-Jabbar. He said the switch to 24 signified the start of the second half of his career. Hello, I enjoy reading all of yur article.I like to write a little comment to support you.